Happy pets are the real way we know we're doing a great job, however, it's very rewarding being recognized in the community for all of our hard work. The biggest compliments come from our clients. Take a peek here to read what some of them have to say about their experience with our facility. 2017: Pawtropolis honored in the Bulldog's 100 Fastest Growing businesses. 2016: Pawtropolis honored in the Bulldog's 100 Fastest Growing businesses. 2015: Pawtropolis honored in the Bulldog's 100 Fastest Growing businesses. 2013: Pawtropolis honored in the Bulldog's 100 Fastest Growing businesses. AKC Obedience Awards - Owner Amanda Crook has obtained over 40 obedience and agility titles with a combination of four dogs. Two of her dogs have ranked in the top 5 for their breeds in the United States forAKC Agility, one even beinginvited to theAKC Invitationals. 2011: Pawtropolis ranked 44 in the Bulldog's 100 Fastest Growing businesses. Pawtropolis owner Amanda Rodriguez Crook received a business growth award at the January 22, 2011 Bulldog 100 celebration of the UGA Alumni Association. The awared was presented by Debbie Dietzler, director of the University of Georgia Alumni Association. The Alumni Association sponsors the Bulldog 100 annual program that determines and awards the 100 fastest growing businesses that are owned or operated by UGA Alumni. Amanda graduated in 2001. Rankings are based on a compounded annual growth rate of revenues for the past three years. Voted Best Kennel 2008 - Pawtropolis won the Athens Banner Herald's 2008 Readers' Choice Award for best kennel. That was the second year in a row. 2007: Women Entrepreneurs - Owner Amanda Rodriguez was in the top three finalists of the Woman Entrepreneur of the Year Award for Georgia. 2007: Top Athens Kennel - Received the Readers' Choice award for the Athens Banner Herald Top Kennel division. 2007: ABKA Community Service Award - Owner Amanda Rodriguez won this award for "Being a very active supporter for ABKA and active in her community. She began a private rescue organization, Helping Paws Rescue," ABKA reported. 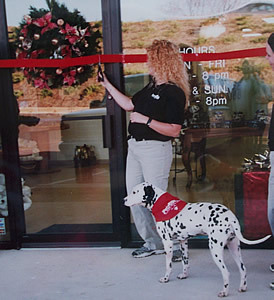 2005: Young Entrepreneur of the Year Pawtropolis owner Amanda Rodriguez is recognized as at the Young Entrepreneur of the Year by the U.S. Small Business Administration. 2004: Christmas Parade Mayor's Choice Award. 2003: Athens Banner Herald Story "Every pet deserves a vacation." 2003: Christmas Parade Float For the second year, our float won Most Original Corporate Division and Best Theme for Corporations. 2002: Christmas Parade Christmas Parade Float won Most Original Corporate Division and Best Theme for Corporations. 2001-Present: ABKA Certified Technicians We have at least 12 employees (around 80%) of our staff that are certified Pet Care Technicians through the ABKA. 2001-Present: Red Cross Pet First Aid We have at least 13 employees that are certified by the American Red Cross in Pet First Aid. 2001: Feature story in the Annual Report of the Georgia Small Business Development Center (SBDC) (page 5) at UGA about Pawtropolis -- then named Petropolis -- and owner Amanda Rodriguez.